This is a new reissue of an album from 1972. I like the blend of folk music and mellow rock on this set. There is a good range, and all the songs are quite strong. 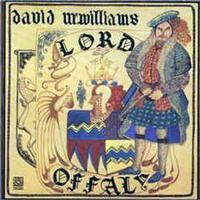 David McWilliams died early in this century, but his music lives on well after his passing. I really like this cut a lot. It's a folk rocker in the 1960s tradition. It's classy stuff with a real classic sound. A mellower cut, this is very much folk music related. It's a ballad that's quite pretty and poignant. A higher energy tune, this is melodic and folky. It has some definite psychedelia in the mix. I like this one a lot. More classy folk rock is on hand here. This isn't a huge change, but it does have some cool guitar soloing. This mellower, pretty cut is very much the kind of thing that made up a lot of soft rock in the 70s. Here we get a very pretty instrumental. It lands near the realm of folk prog. This feels like a cross between Bob Dylan and the Byrds. It's a classy tune with both rock and folk in the mix. There is a bluesy kind of vibe to this. Yet it's a rock song based on folk concepts. It's a powerful tune with a definite slice of folk prog in the mix. There is a reason this is the title track. It's one of the most distinctive and powerful things here. It has a haunting, almost stripped back arrangement. At over six and a half minutes in length, it's also the longest track here. This is more of a pure folk cut. The overlayers of sound lend something akin to world music based prog. It's a strong tune. More of a folk rocker, this is classy stuff for sure. It's a niec way to end things in style.